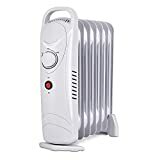 Air Choice - 700 Watt Oil Heater Radiator: Space Heater • The Air Geeks, reviews of air conditioners, dehumidifiers and air purifiers. If you are looking for a small portable oil heater that won’t cut into your paycheck too much during the colder months, we stumbled across this Air Choice Oil Heater that we thought you might like. Though not the greatest out there, the oil heating technology has quite a following due to its durability and safety. It is a small room heater that is meant to be very portable and maintenance free. Here at The Air Geeks, we rank space heaters according to safety, portability, and ease of use, noise level, heat output, and the overall design. Let’s see how it fairs on these features. If you’ve got kids, this is one of the safest options. Oil heaters have been known to be the safest around children and babies as there is no actual flame. With over 56,000 reported fires involving heating equipment resulting to over 500 deaths and over $1.3 billion worth of damage in 2014 alone, you will want to make sure that your appliance will help in ensuring that its usage will not result in tears. With that mind, this heater passes our safety test because it has an automatic shut-off feature that ensures the device is not running when it is knocked over or when the device’s internal components overheat to over 105 F. Overheating can occur if there is an overload in the power lines or a default causing an anomaly on the heat regulator. The company also has a patented steel-assembly technology on this space heater. The steel reservoir never needs refilling as it is permanently sealed. This also adds another layer of protection as it prevents mishaps when dealing with the appliance. This appliance is very easy to use and it is almost maintenance free. Everything is firmly sealed and doesn’t need any tinkering. A convenient handle ensures you can have a firm grip while carrying the appliance. At only 8.2 pounds, this space heater is very portable and can be relocated from one room to another with ease. It fits well in your travel bag as it is only 15 inches high meaning you can carry it with you to the office or use it in a hotel. Air Choice Oil Heater works in dead silence. There are no moving parts on this heater as it does not have a fan. The oil heater works by heating the oil inside the pipes which in turn exchanges the heat to the surrounding air. When air gets heated up, it is replaced by cooler air by convection currents and the cycle continues until the room is sufficiently cozy. This makes it suitable for your bedroom or study rooms as the device is barely noticeable even when running. However, the only downside to this mode of heating is that it is slow. Compared to other competitors that use fans to distribute air faster by using a mixture of heat oscillation and vortex technology to reduce the probability of hot and cool spots, this technology might not be able to achieve this. It has a maximum heat output of 700 Watts. It does not have a thermostat but a control knob that lets you choose between 1 to 6 levels of temperature. There is also no way to know the temperatures you are operating on. A workaround for this hassle is to use a thermometer and use it to play with the settings until you find your desired temperatures. There is an ECO-mode that ensures maximum energy savings. There are no timers so you will have to rely on external ones if you want to run the appliance for a specific period. The company offers a 100% guarantee program on defective parts by offering replacements and discounts depending on what you want. Safety features • Tip-over Cut Off Switch, Overheat Protection. It is very quiet:If you love quiet rooms when sleeping, this heater is very good at keeping the noise level to the minimum. Limited scope:With its small size, you can't rely on it to work on large areas such as living rooms or offices. Control Panel doesn't have a display:No ability to tell which values the appliance is working on. The heater is smaller than I initially thought. It’s adorable but mostly good for maintaining a temperature of a small room. I’d imagine it would take 8+ hours to truly warm a room significantly to where you would notice a small space heater is in the room. The unit gets very warm but the warmth does not radiate from the unit very far, a combination of a fan blowing at the unit might help to circulate warmth more quickly to warm a room a bit faster. I bought it for guests to have turned on while visiting during the winter." This heater works great! Keeps the room we have it in nice and warm. We have it in our 2 girls bedroom and as long as their door is shut its warmer in there than the rest of the house. It's only on when they are in there. Very easy to use and small so it fits great!" It is not very hard to see that this appliance lacks a lot of important features, including a fan-mode and oscillation. A good control panel with a thermostat would have been a great addition at this price. But alas, if you need a small portable heater that you can use to warm your feet in the office, or use in the kids’ bedroom, this is a good pick. Many oil heater lovers probably are already aware of the not-so-fast heating speeds and so they might not be bothered by it. Safety is the key selling point here and if you are cautious about heaters, this would be a good place to start.